It’s a bird… It’s a plane… It’s Superman! Flying without the use of energy has always been seen a superpower that people have dreamed of. Such an ability has already been achieved by such birds as the Albatross and Petrel. By using the gust soaring, the Albatross can fly hundreds of miles without so much as flapping its wings. Although the idea of gliding with the wind is a relatively simple concept, researchers today are still puzzled by the amazing abilities of these birds. All flying objects require a force of lift to achieve and maintain flight. For most birds, this is achieved by flapping their wings. For the Albatross and various species of Petrel, however, it is observed that they can obtain the force of lift necessary to maintain or even increase altitude by angling themselves to the horizontal motion of the wind relative to the water. This in turn would allow them to extract kinetic energy from the air, allowing them to soar at high altitudes without flapping their wings. In some cases, the birds are required to turn to extreme angles of bank, of around 60–70º (sometimes past the vertical) with the bird’s ventral side facing the wind. This can be seen in the picture above. 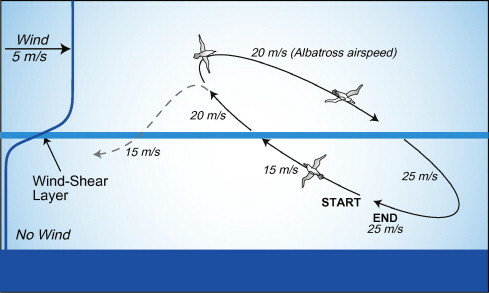 Gust soaring can also be seen close to the surface of the ocean, but this requires more complicated reasoning due to the fact that the winds are not as strong at lower altitudes. Colin J. Pennycuick observed that the albatrosses (Diomedeidae), many species of petrels and shearwaters (Procellariidae) and stormpetrels (Hydrobatidae) skim over the crests of the waves, in and out of the troughs. 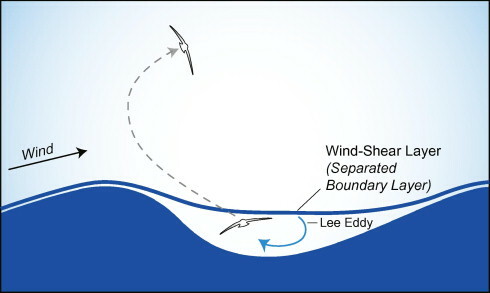 As a bird passes in and out of the separation bubbles in the lee of wave crests, it encounters sudden shifts of wind speed and direction, both horizontal and vertical, which can be used to replenish its kinetic energy.